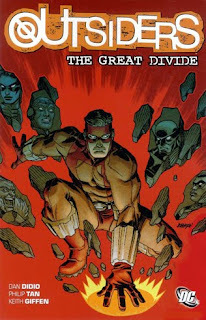 Something I can say for Dan DiDio's Outsiders: The Great Divide, with artists including Keith Giffen, is that it makes me eager for DiDio and Giffen's new OMAC series. Giffen is in full-on Jack Kirby mode here, with craggy, squarish heads and Kirby dots aplenty; I'm eager to see what he does once he's actually penning Kirby's creations. As for the rest of the book, DiDio's is a so-so Outsiders story that would show a lot of promise, outside of its wooden dialogue, if it would ever actually congeal into anything. It's hard for me to believe that DiDio -- of all the writers writing the pre-Flashpoint end of the DC Comics series -- couldn't know, expect, and plan for the sudden end of his comic, but that's how it seems. DiDio rushes to tie up a dozen plotlines, leaving many by the wayside and really not offering a satisfying conclusion at all. I imagine any affection for the Outsiders among this series' readership has long since dried up, and the only ones still following are those, like me, who're merely curious to see what a Dan DiDio-penned comic book is like. I am quite complementary about DiDio's editorship, believing he breathed new life into the DC Universe from the moment he took over, but his tenure on Outsiders fails to distinguish the series. One positive to come out of Dan DiDio's Outsiders is that he creates a team of old, older, and new members that's, in the end, potentially viable (irrespective of that, at the end of the old DC Universe, we may barely if ever see this team in play). Great Divide is an exercise in Outsiders cameos -- and even esoteric DC Universe cameos, if that's your cup of tea. I loved that DiDio brought back Technocrat from the Outsiders Alpha/Omega era, and also that Grace and Thunder rejoin the team (from Judd Winick's run) before the story closes. DiDio also uses a Shaggy Man, references both the Reign in Hell miniseries and DC's 1990s Bloodlines crossover; he even finds a home for the Olympian recently bumped out of Wonder Woman. For a continuity nut, that was enough to catch my interest every couple of pages, but it's clear the bevy of appearances are working to make up for what this book otherwise lacks in plot. The greatest difficulty with Great Divide is that it sacrifices action for story -- or perhaps, mistakes the two. The first issue is mostly devoted to the Creeper fightning his way out of Hell; we learn belatedly that he gained some new powers, but the thread otherwise has no bearing on the main story. In the second issue, Geo-Force fights his estranged wife Geode; that fight ends, literally, when Geo-Force teleports mid-fight and wakes up unaffected in his palace, such that there, too, the reader wonders at the necessity of the previous pages. Geo-Force fights the Olympian, but they ultimately team up; Freight Train fights the Shaggy Man, who simply disappears; the Outsiders fight the Justice Society to fill a couple pages before Amanda Waller arrives. I don't mind a good action sequence once in a while, or even a more action-devoted comic (see Superman: Return of Doomsday, for instance, of which DiDio wrote one part). But the action sequences here don't so much move the story forward as simply spin its wheels, when there's much in the story that DiDio could have expounded on in those pages -- from the roots of Geo-Force's madness to why Katana remains loyal to him, or more about Creeper or new Outsider Herald or the story's secret villain Veritas. Great Divide ends with some question as to whether Geo-Force is indeed being plagued by Veritas, or if he's just a "mad king." The latter is the more interesting prospect, and indeed the idea of the Outsiders following an insane but heroic leader might've been this book's best outcome. Instead, given that Herald, among others, has also seen Veritas, the first option is the more likely. That DiDio ends the book uncertainly isn't a problem, but the story does feel incomplete in that we never get the promised showdown between Geo-Force and Black Lightning, and that Batman arrives as a deus ex machina to make it all better. We're promised more of the new Outsiders in the pages of Batman, Inc., but there's a sense more that Great Divide was just needless prelude than the first chapter of a larger adventure. Another interpretation of Great Divide is that it's DiDio's first attempt at a creative style much ballyhooed in DC's New 52, where the book's artist becomes part plotter on the book, such to make the comic more visually exciting. In each of Great Divide's issues, DiDio shares plotting credits with artists Giffen, Philip Tan, and Joe Bennett. Divide is a visually appealing book -- not groundbreaking, but with some nice double-page spreads by Giffen especially -- so maybe this experiment works, though again I can't help suspecting that greater artist control and the emphasis on action over plot might go hand in hand. That's not a generalization about all artists, many of whom are fine writers (Dan Jurgens, off the top of my head); just what I notice here. Outsiders: The Great Divide -- as was fairly obvious from the last volume, Outsiders: The Road to Hell -- is not a comic I would put at the top of my recommendation pile. It pays some nice tributes to Outsiders history, but the story does not do much to set itself apart, not does it come to a fulfilling close. There are some, no doubt, that will take some glee in this given that the writer is Dan DiDio himself; I'm disappointed simply because of my enjoyment of Outsiders series gone past, and I hope that should DC decide to resurrect the Outsiders again, the results will be different. Later this week, the Collected Editions review of Secret Six: The Darkest House. But first, tomorrow we unveil a new way to enjoy the DC Trade Paperback Timeline ... don't miss it! OMAC is the only one of the "Sayonara Six" that I'm sorry to see go (although the six new titles seem mostly interesting). It was fun each month, and I am curious how it'll read in trade, since it feels like a return to the tone of Kirby's series - big blue thing roughs up creepy creatures while Brother Eye plots and broods. Looks like OMAC is back just after the series cancellation, guest-starring in Justice League International. Sounds good to me -- glad DC isn't just letting those disappear once their series' are cancelled -- but doesn't it seem like there's an awful lot of crossovers in the new DCU? Most of the Young Justice books, most of the Batman books, JLI, Blue Beetle/Green Lantern: New Guardians, Animal Man with Constantine plus Swamp Thing with Animal Man, and Suicide Squad/Resurrection Man! I'm not complaining, but I wonder what DC's strategy is. I'm not too thrilled with the crossovers, but I guess it's really not too different from what they've done in the last...25 years? I've been buying the 4 GL books (including New Guardians), Swamp Thing, and Resurrection Man. Now I have to decide if I want to buy this month's Blue Beetle, Animal Man, and Suicide Squad books as well. To be honest, it's actually making me reconsider the Swamp Thing and Resurrection Man books; do I want to keep buying them, if they're going to be hanging out in an end of the DCU that I'm otherwise not interested in? I may use DC's collections as a guide to what I end up buying; that is, if the tie-in issues are so important that they're included in (for example) the GL: New Guardians Vol 2 book, then I'll pick up the digital copy of Blue Beetle. But if it's left out, then I may just skip it myself as well.